Jon Jones is set to defend his Light Heavyweight belt against Anthony “Lionheart” Smith this Saturday night (March 2, 2019), inside of T-Mobile Arena, in Paradise, Nevada. But if the current UFC 205-pound champion would be given a chance to choose his next opponent between the WWE star Brock Lesnar and the UFC Heavyweight king Daniel Cormier, it wouldn’t be a difficult decision. Jon Jones fought Daniel Cormier two times. “Bones” was better at UFC 182, on January 3, 2015, where he earned a unanimous decision win. The two met again at UFC 214, on July 29, 2017. Jon Jones won via head kick KO, but the result was overturned to no contest after Jones’ samples were tested positive on Turinabol. Luckily for Jon Jones, “substantial assistance rule” was his ally, and he slipped through with a 15-month suspension. Cormier later accused him of snitching his teammates to get reduced penalty, but Jones claimed he didn’t do that. A few days ago, Jon Jones set strict terms for potential trilogy bout against Daniel Cormier in UFC Heavyweight division. Jones “has nothing to prove”, so only a monstrous paycheck might make him reconsider third meeting against Cormier. Jon Jones demands a lot of money since he believes fighting “GOAT” Cormier at 265-pound division might be very risky for his health. 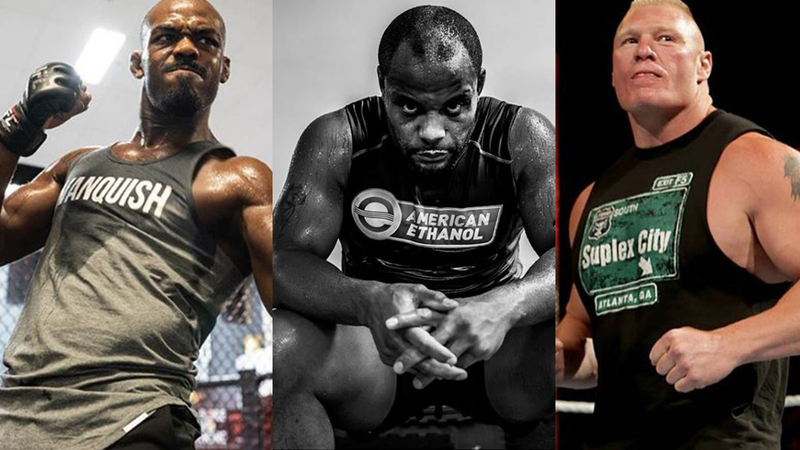 Would you rather watch Jones fighting Cormier or the WWE champ Brock Lesnar?